Obama’s Spending: ‘Inferno’ or Not? Spending is high by historical standards -- but rising slowly. And revenues are low. Is President Obama’s spending an “inferno,” as Mitt Romney claims, or a binge that “never happened” as an analysis touted by the White House concluded? We judge that both of those claims are wrong on the facts. That includes spending for the bank bailout legislation approved by President Bush. Annual increases in amounts actually spent since fiscal 2009 have been relatively modest. In fact, spending for the first seven months of the current fiscal year is running slightly below the same period last year, and below projections. Since pictures can convey information more efficiently than words, we’ll sum up the official spending figures in this chart. It also reflects our finding that Obama increased fiscal 2009 spending by at most $203 billion, accounting for well under half the huge increase that year. So if current spending is an “inferno,” it’s one that Bush (and Congress) is mostly responsible for starting. But it’s also true that Obama has done little to put it out. Spending under Obama remains at a level that is quite high by historical standards. Measured as a percentage of the nation’s economic production, it reached the highest level since World War II in fiscal 2009, and has declined only slightly since. And there’s more spending to come: The health care law Obama signed in 2010 calls for a new wave starting in 2014, to subsidize coverage for millions who wouldn’t otherwise have it. That will be adding an estimated $110 billion to federal outlays in fiscal 2015, and more in later years. But note also that receipts are running at levels that are well below historical averages. It is the combination of historically high spending and low revenues that is producing the current string of trillion-dollar annual deficits, and piling up debt. Those who blame deficits solely on spending ignore the other side of the ledger. Fiscal 2009 began Oct. 1, 2008. That was before Obama was elected, and nearly four months before he took office on Jan. 20, 2009. Bush also signed, on Oct. 3, 2008, a bank bailout bill that authorized another $700 billion to avert a looming financial collapse (though not all of that would end up being spent in fiscal 2009, and Obama later signed a measure reducing total authorized bailout spending to $475 billion). CBO attributed the rapid rise in spending to the bank bailout and the federal takeover of Fannie Mae and Freddie Mac — plus rising costs for unemployment insurance and other factors driven by the collapsing economy (which shed 818,000 jobs in January alone). Another factor beyond Obama’s control was an automatic 5.8 percent cost of living increase announced in October 2008 and given to Social Security beneficiaries in January 2009. It was the largest since 1982. Social Security spending alone rose $66 billion in fiscal 2009, and Medicare spending, driven by rising medical costs, rose $39 billion. How Much Did Obama Add? But it’s also true that Obama signed a number of appropriations bills, plus other legislation and executive orders, that raised spending for the remainder of fiscal 2009 even above the path set by Bush. By our calculations, Obama can be fairly assigned responsibility for a maximum of $203 billion in additional spending for that year. It can be argued that the total should be lower. Economist Daniel J. Mitchell of the libertarian CATO Institute — who once served on the Republican staff of the Senate Finance Committee — has put the figure at $140 billion. Ordinarily, an incoming president has little or no influence over spending that was approved under his predecessor. So in normal circumstances, all spending for fiscal year 2009 would have been rightly tied to Bush, and fiscal 2010 would be the first year for which Obama would have prepared a budget and signed the major spending bills. And for the most part, big spending programs that require no yearly appropriations, including Social Security and Medicare, did indeed continue to operate during fiscal 2009 under the policies in effect under Bush. But in Obama’s case, he quickly pushed through Congress and signed a large economic stimulus measure containing a combination of tax cuts and new spending in fiscal 2009. And while Bush had signed full-year appropriations for the Pentagon, the Department of Homeland Security and veterans programs, he had left the remainder of government agencies that need annual appropriations funded only through March 2009. $2 billion for children’s health insurance. On Feb. 4, Obama signed a bill expanding the Children’s Health Insurance Program, covering millions of additional children (a Democratic bill Bush had vetoed in the previous Congress). “CBO estimates that the act will increase mandatory outlays by $2 billion in 2009,” CBO later stated (page 5). $114 billion in stimulus spending. Obama signed the stimulus bill Feb. 17. While headlines proclaimed a $787 billion price tag, about 27 percent of the total was actually for tax cuts, not spending. And most of the spending didn’t take place until after fiscal 2009. CBO initially put the total spent in fiscal 2009 at $107.8 billion, but the following year it revised the figure upward to $114 billion, in a report issued in August 2010 (page 13). $32 billion of the “omnibus” spending bill Obama signed on March 11, 2009, to keep the agencies that Bush had not fully funded running through the remainder of the fiscal year. The $410 billion measure included $32 billion more than had been spent the previous year, according to a floor statement by Rep. Jerry Lewis of California, the top-ranking Republican on the Appropriations Committee. (See page H2790 in the Congressional Record.) “An 8 percent—or a $32 billion—increase in 1 year on top of the stimulus package is simply unnecessary and unsustainable,” he declared. A case can be made that Obama shouldn’t be held responsible for the entire $32 billion increase. The $410 billion was only $20 billion more than Bush had requested, according to Rep. David Obey of Wisconsin, the appropriations chairman. (See page H2800.) And CBO later figured the increase amounted to only $9 billion over what it was projecting on the assumption that the levels Bush approved for the first part of the year would be extended for the entire year (page 5). But it was Obama who signed the bill, so we assign responsibility for the full annual increase to him, not Bush. $2 billion for deposit insurance. The “Helping Families Save Their Homes Act” that Obama signed May 20 had among its many provisions some changes to the federal program that insures bank deposits. CBO later estimated that would increase fiscal 2009 outlays by $2 billion (page 54). $31 billion in “supplemental” spending for the military and other purposes. Obama pushed for and signed on June 24 another spending measure. The press dubbed it a “war funding” bill, but it actually contained $26 billion for non-defense measures (including funding for flu vaccine against the H1N1 virus, and for the International Monetary Fund) in addition to $80 billion for the military. Here again, a case can be made that Obama isn’t responsible for the entire $31 billion. Economist Mitchell argues that $25 billion in military spending should be assigned to Bush, because “Bush surely would have asked for at least that much extra spending.” But he didn’t. So rather than speculate, we’ll assign it all to Obama, who asked for it. $20 billion for GM and Chrysler bailouts. At one point the government had paid out nearly $80 billion to support the automakers. But some of this was Bush’s doing, and much has been repaid and will be in the future. By the time Obama took office, Bush already had loaned nearly $21 billion to the two automakers from funds appropriated originally for the Troubled Asset Relief Program, and had committed the government to lend $4 billion more. But Bush left decisions on further aid to Obama, who poured in additional billions. By the end of the fiscal year, the Treasury had made approximately $76 billion in loans and equity investments to GM, Chrysler and their respective financing entities (some had already been repaid). But for budget accounting purposes, not all of this was counted as federal spending under the TARP law. That’s because the government stood to receive loan repayments with interest, and held nearly 61 percent of the stock of the reorganized General Motors. What was counted as spending was — in rough terms — the difference between the estimated future value of those assets to taxpayers and their initial cost. Treasury put the net cost of the GM and Chrysler support during fiscal 2009 at $45 billion (see page 110, the “Total subsidy cost” line under the heading “AIFP,” for Automotive Industry Financing Program). That’s the amount officially booked as a federal outlay for fiscal 2009. We assume — we think reasonably — that the $25 billion committed under Bush would have been lost had Obama done nothing. So we subtract the full amount of Bush’s commitment from the net total of $45 billion that Treasury initially estimated for fiscal 2009. For the record, the ultimate total cost of the auto bailout is now estimated to be lower than initially expected. It is put at $21 billion by the Treasury Department (see page 5) and and only $19 billion by CBO (see Table 3). But those lowered estimates don’t affect what was booked as spending in fiscal 2009. Other big domestic programs that don’t require yearly appropriations, including Social Security and Medicare, continued to operate as they had under Bush. One big fiscal 2009 spending increase resulted from an unusually large 5.8 percent cost of living increase that took effect just before Obama took office. That was an anomaly, as we explained in “Social Security COLA,” posted Sept. 23, 2009, and there would be no COLA at all for the next two years. The same 5.8 percent COLA also was given in 2009 to millions of federal retirees, military retirees and disabled veterans and their survivors. So by our calculations, Obama can fairly be assigned responsibility for — at most — 5.8 percent of the $3.5 trillion that the federal government actually spent in fiscal 2009, which was 17.9 percent higher than fiscal 2008. A Binge That ‘Never Happened’? That raised howls and rebuttals from conservative stalwarts at the Wall Street Journal’s own editorial page, at the libertarian Reason magazine, at the Heritage Foundation and even from Cato’s economist Mitchell, who called Nutting’s comparisons “nutty” in a piece for the Forbes magazine website, even though Nutting based his analysis in part on the same $140 billion figure Mitchell uses for Obama’s fiscal 2009 spending. Our own analysis leads us to conclude that Obama deserves responsibility for somewhat more fiscal 2009 spending than Nutting or Mitchell assign to him, as we’ve noted. Spending in that year shot up an incredible $535 billion. Nutting and Mitchell hold Obama responsible for only 26 percent of that increase, but we conclude that Obama can fairly be assigned responsibility for as much as 38 percent. We also disagree with Nutting’s conclusion that Obama’s increases are the lowest since Eisenhower. Not only should Nutting have measured Obama’s increases from a lower base, in our judgment, he also fails to take account of inflation, which has been extraordinarily low during Obama’s term. 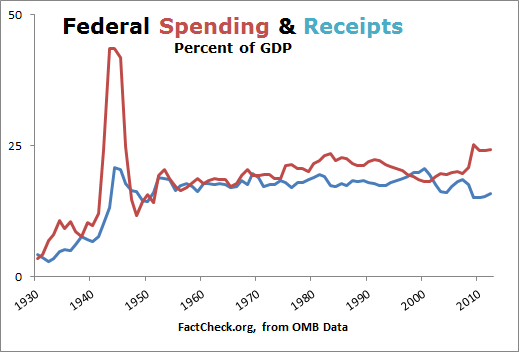 Since fiscal 2009, however, it cannot be denied that spending has increased only modestly. Total federal outlays actually went down 1.7 percent in fiscal 2010, for example, then rose a little more than 4 percent in the fiscal year that ended Sept. 30. Spending was projected by CBO to rise less than 1 percent in fiscal 2012. In fact, CBO reported on May 7 in its most recent monthly budget report that spending for the first seven months of the current fiscal year was 3.4 percent below the same period a year ago. That was mostly due to differences in timing of certain payments, but even adjusting for those, CBO figured spending is 0.8 percent lower so far this year. Update, June 7: A new CBO monthly report, issued after this article was posted, showed outlays for the first eight months of the fiscal year running 1.2 percent higher than the same period a year earlier, after adjusting for timing of payments and also after taking account of an unusual adjustment to TARP outlays booked in May 2011. The June 7 CBO report thus shows fiscal 2012 spending to be on track to increase only slightly for the full fiscal year ending Sept. 30. All of the yearly changes under Obama are well below the 7 percent average annual increase under Bush prior to fiscal 2009. And in that year — for which we assign most of the increase to Bush — the rise amounted to a staggering 17.9 percent. Actually, not so much. A close look shows the TARP effect has been rather modest. Spending on the TARP program turned out to be much less than the $700 billion originally authorized. Congress later reduced the authorization to $475 billion in the Dodd-Frank Wall Street Reform and Consumer Protection Act that Obama signed on July 21, 2010. And not all was spent in 2009. Actual outlays for TARP in fiscal 2009 totaled $154 billion, according to the CBO. So the one-time bump in spending amounted to about 4 percent of fiscal 2009 spending. It’s true that money recovered since then is recorded as negative spending rather than as increased revenues. And that does artificially reduce Obama’s spending figures — but not by much. TARP decreased federal spending by $108 billion in fiscal 2010 and $39 billion last year, according to the CBO. Those artificial reductions brought down federal spending by just 3 percent in fiscal 2010, and 1 percent in fiscal 2011. Even without those reductions, Obama’s spending increases wouldn’t come close to equaling the average annual increase under Bush. Nevertheless, the spending Obama inherited was so high that even modest increases keep it at a level that is extraordinarily lofty by historical standards. Perhaps the most relevant measure of federal spending is how it compares with the nation’s total economic output, as measured by gross domestic product. 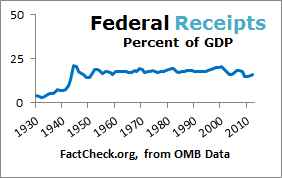 And spending in fiscal 2009 hit 25.2 percent of GDP — the highest since 1945. It hasn’t come down much since that postwar record. It was 24.1 percent of GDP in both fiscal 2010 and 2011. 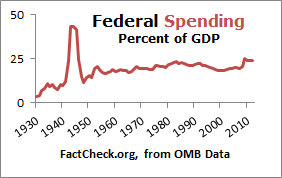 Spending for each of the last three fiscal years was higher than any since 1946. Beyond this year, future spending levels are impossible to predict with any accuracy. Congress has yet to pass a single one of the 12 regular appropriations bills for the fiscal year starting Oct. 1, and it remains to be seen if Congress will undo the harsh, automatic cuts in military and domestic spending enacted in last year’s bargain to increase the debt ceiling. The Supreme Court is also considering whether or not to strike down the health care law. Furthermore, another spending showdown is looming. The government’s borrowing will soon force Congress to consider raising the legal debt ceiling once again, probably early next year. And House Speaker John Boehner has declared that “I will again insist on my simple principle of cuts and reforms greater than the debt limit increase.” So the president and Democrats will soon face another clash with congressional Republicans over spending levels and government revenues. We won’t presume to predict the outcome of the coming budget Armageddon, likely to take place next January or thereabouts. Much will depend on whether Obama or Romney wins the November election, and which party wins control of the House and Senate. At issue, however, will be both spending and revenues. So we’ll end by reminding readers that while spending as a percentage of GDP is running at the highest level since the 1940s, tax revenues are also low by historical standards. For fiscal 2009 and 2010, receipts were just 15.1 percent of GDP, and last year they inched up to 15.4 percent. They haven’t been that low since 1950. And prior to 2009, the average since the end of World War II was 17.8 percent. Friedman, Emily. “Romney Warns of Obama’s Debt, Spending ‘Inferno’.” ABC News. 15 May 2012. The Associated Press. “Bush signs sprawling spending bill.” USA Today. 30 Sep 2008. Sahadi, Jeanne. “Bailout is law: President Bush signs historic $700 billion plan aimed at stemming credit crisis.” CNNMoney.com. 4 Oct 2008. Congressional Budget Office. “The Budget and Economic Outlook: Fiscal Years 2009 to 2019.” 7 Jan 2009. U.S. Social Security Administration. “Social Security Announces 5.8 Percent Benefit Increase for 2009.” Press release. 16 Oct 2009. U.S. Social Security Administration. “History of Automatic Cost-Of-Living Adjustments.” Web page. Accessed 4 Jun 2012. Office of Management and Budget. “Historical Tables: Table 3.2—OUTLAYS BY FUNCTION AND SUBFUNCTION: 1962–2017.” 13 Feb 2012. The Library of Congress. “Status of Appropriations Legislation for Fiscal Year 2009.” Thomas website. Accessed 4 Jun 2012. Mitchell, Daniel J. “Defending Obama…Again.” Blog post. 27 Nov 2009. Kornblut, Anne E. “Obama Signs S-CHIP Legislation.” 4 Feb 2009. Congressional Budget Office. “A Preliminary Analysis of the President’s Budget and an Update of CBO’s Budget and Economic Outlook.” 20 Mar 2009. Skiba, Katherine. “As Obama Signs $787 Billion Stimulus, the Question Is, Will it Work?” U.S. News & World Report. 17 Feb 2009. Congressional Budget Office. “Conference Agreement for H.R. 1 (the American Recovery and Reinvestment Act of 2009)” 13 Feb 2009. Congressional Budget Office. “The Budget and Economic Outlook: An Update.” 18 Aug 2010. The White House. “Statement by the President.” 11 Mar 2009. Congressional Record. 25 Feb 2009; H2790, H2800. The White House. “Remarks by the president at the signing of the Helping Families Save Their Homes Act and the Fraud Enforcement and Recovery Act.” 20 May 2009. Congressional Budget Office. “The Budget and Economic Outlook: An Update.” 25 Aug 2009. Office of Management and Budget. “Statement of Administration Policy: H.R. 2346 – Supplemental Appropriations Act, 2009.” 13 May 2009. The White House. “Statement from the President upon signing HR 2346 on June 24, 2009.” 26 Jun 2009. Fletcher, Michael A. “Obama Signs War Funding Bill.” Washington Post. 26 Jun 2009. Congressional Budget Office. “Supplemental Appropriations from 2000 to 2010.” 1 Oct 2010. Congressional Record. 18 Jun 2009; S2776. New York Times. “Car Allowance Rebate System (Cash for Clunkers)” 20 Aug 2009. The White House. “Statement by the Press Secretary.” 7 Aug 2009. Budget of the U. S. Government, Appendix. “Federal Funds: CONSUMER ASSISTANCE TO RECYCLE AND SAVE PROGRAM” 1 Feb 2010; 959. Congressional Budget Office. “The Troubled Asset Relief Program: Report on Transactions Through December 31, 2008.” Jan 2009. U.S. Treasury Department, Office of Financial Stability. “Troubled Asset Relief Program Transactions Report For Period Ending January 16, 2009” 22 Jan 2009. U.S. Treasury Department. “Troubled Asset Relief Program (TARP)Monthly Report to Congress – April 2012” 10 May 2012. U.S. Department of the Treasury, Office of Financial Stability “Agency Financial Report; Fiscal Year 2009.” 10 Oct 2009. Congressional Budget Office. “Report on the Troubled Asset Relief Program – March 2012” 28 Mar 2012. Jackson, Brooks. “Social Security COLA.” FactCheck.org. 23 Sep 2009. U.S. Office of Personnel Management. “January 2009 Cost-of-Living Adjustment (COLA) for Civil Service Annuitants.” Undated Web page. Accessed 4 Jun 2012. Military.com. “Retirees Get 5.8% COLA for 2009.” 20 Oct 2008. Nutting, Rex. “Obama Spending Binge Never Happened.” 22 May 2012. Taranto, James. “Obama’s Permanent Emergency: How to disguise a spending binge.” 23 May 2012. Suderman, Peter. “The Obama Spending Binge.” Reason magazine. 23 May 2012. Darling, Bryan. “The Truth about President Obama’s Skyrocketing Spending.” Heritage Foundation. 24 May 2012. Mitchell, Daniel J. “Mirror, Mirror, on the Wall, Which President Is the Biggest Spender of All?” Forbes.com. 24 May 2012. Jacobson, Lewis. “Viral Facebook post says Barack Obama has lowest spending record of any recent president.” Politifact.com. 23 May 2012. Kessler, Glenn. 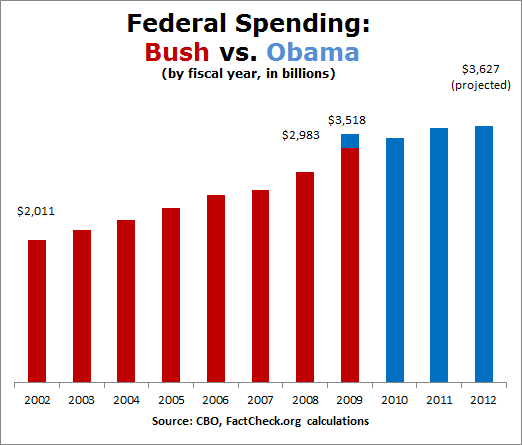 “The facts about the growth of spending under Obama, Part 2.” 31 May 2012. Taylor, Andrew. “FACT CHECK: Obama off on thrifty spending claim.” The Associated Press. 26 May 2012. Congressional Budget Office. “Monthly Budget Review: Fiscal Year 2012.” 7 May 2012. Congressional Budget Office. “Report on the Troubled Asset Relief Program—November 2010.” 29 Nov 2010. The Associated Press. “Historic financial overhaul signed into law by Obama.” 21 Jul 2010. Congressional Budget Office. “Monthly Budget Review: Fiscal Year 2012.” 7 Nov 2011. Congressional Budget Office. “Updated Estimates for the Insurance Coverage Provisions of the Affordable Care Act.” 13 Mar 2012. Library of Congress. “Status of Appropriations Legislation for Fiscal Year 2013.” 1 Jun 2012, accessed 4 Jun 2012. Montgomery, Lori. “Boehner threatens another debt-ceiling fight.” Washington Post. 15 May 2012. Klein, Ezra. “Wonkbook: Of course Boehner wants another debt-ceiling showdown.” Washington Post. 16 May 2012. Office of Management and Budget. “Historical Tables: Table 1.2—Summary of Receipts, Outlays, and Surpluses or Deficits (-) as Percentages of GDP: 1930–2017.” 13 Feb 2012.